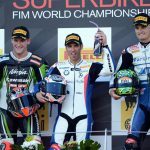 Marco Melandri bit a chunk off of Max Biaggi‘s World Superbike championship points lead by taking a pair of wins at Brno. The double was the first in Melandri’s career and the first for BMW. Biaggi, who arrived in the Czech Republic with four wins and nine podium finishes in ten previous races at Brno, was held off the podium this year, shrinking his lead in the championship to 21 points from 48. 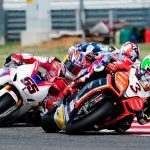 Both races saw Melandri steal the win from Kawasaki‘s Tom Sykes who led all but seven laps all weekend but was forced to settle for a pair of second-place results. The riders lined up on the grid in mixed conditions for Race One, resulting in a mixture of slick and intermediate tires. Sykes took the early lead after starting in pole position, his seventh pole of the season. Not far behind him were the Althea Ducati duo of Davide Giugliano and Carlos Checa, the beleaguered Effenbert-Liberty Ducati team’s Maxime Berger and Sykes’ teammate, Loris Baz. Berger took over the lead on Lap Three in an impressive showing despite starting 19th on the grid. Berger led for four laps before Sykes regained the lead, an advantage he would hold until lap 18. Meanwhile, BMW’s Melandri began his progression through the ranks after starting fifth on the grid. Melandri dropped back as far eighth place at the mid-way point of the race but then began to reel in the riders ahead of him. By Lap 15 he was back in fifth position and by Lap 17 he passed Checa and into position for a podium. Melandri passed Honda‘s Jonathan Rea on Lap 18 to move into second place behind Sykes with Checa also in the mix. A lap later, and Melandri passed Sykes to claim the lead. Sykes tried to take back the lead but bumped into Rea who was attempting to go through on the inside of a corner. 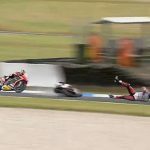 Rea was sent flying across the track with Checa slamming on the brakes to avoid a disastrous accident. Sykes was able to continue but the collision cost him a chance to steal back the lead. Melandri took Race One by a 1.360 second margin over Sykes with Baz finishing third to put a pair of Kawasakis on the podium. Checa finished fourth ahead of Aprilia’s Eugene Laverty and Biaggi. Sykes took the early lead once again in a dry Race Two, with Laverty close behind him on the Aprilia. Just a bit further back were BMW teammates Leon Haslam and Melandri. The two BMWs moved past Laverty on Lap Two but the two teammates bumped exiting a corner while battling for second, with Melandri emerging with the advantage. Melandri briefly took the lead on Lap 14 but Sykes quickly moved back in front. Melandri’s chance finally came on the final lap as he moved back into the lead and held on to win by 0.140 seconds. Sykes finished with another second-place result, no doubt a disappointment after leading 33 of 40 laps on the weekend. Checa finished third to complete the podium with Biaggi fourth and Laverty in fifth place. 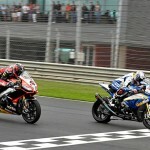 The 2012 WSBK Championship resumes Aug. 5 at Britain’s Silverstone circuit. Biaggi remains in the lead with 271.5 points but Melandri’s double moves him to within 21 points at 250.5. Sykes is still within reach at 212.5 points for third place. Checa is fourth at 204.5 points but his chances of defending his title look slim.